Meanwhile the President of VROAN, KassimOlatunbosun aka Boe, has been declared wanted by his members and the police. He is accused of wanton embezzlement of public funds at his disposal. 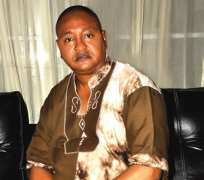 Kassim is said to have mismanaged the royalties for marketers and film producers that his members paid into the coffers of VROAN over the last two years. They also claimed that he refused to call for elections after staying in office for more than 10 years. According to information made known to NOLLYWOOD INSIDER, after a long meeting at the Cultural Center, Alausa, Ikeja, on Thursday October 10th, 2013, by his members and other concerned stakeholders, the enraged crowd besieged his Onipanu office calling on him to render account of his stewardship as VROAN's henchman. However, on sighting the crowd while he was having his weekly meeting with executives of the association, Kassim managed to scale over a high fence into oblivion. This was after JideKosoko and a few others had sustained injuries during a fight to apprehend Kassim. JideKosoko spoke further on the incident, “Actually, I am a member of the Board of Trustees of VROAN, and we had been getting several reports that the president of the association, Kassim aka Boe, has been in the office for close to 10 years. We have received several complaints that his tenure has since lapsed, and that there should have been an election, but he insisted on staying. This is coupled with other atrocities of his, so the BOT had to invite him, but he refused to come to any of the meetings on several occasions. He goes about with thugs with dangerous weapons, most of whom are not owners of video clubs. Meanwhile, JideKosoko disclosed that the matter is now with the Nigerian Police Zone 2, Lagos.